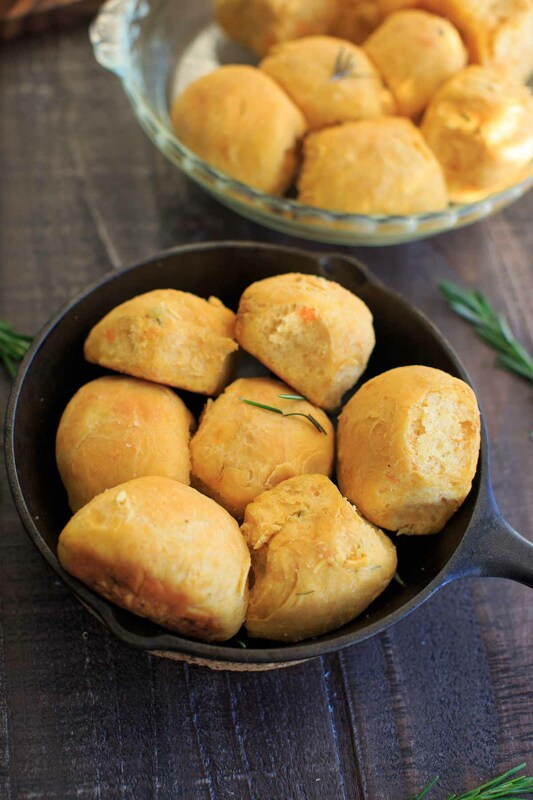 Rosemary Maple Sweet Potato Dinner Rolls. 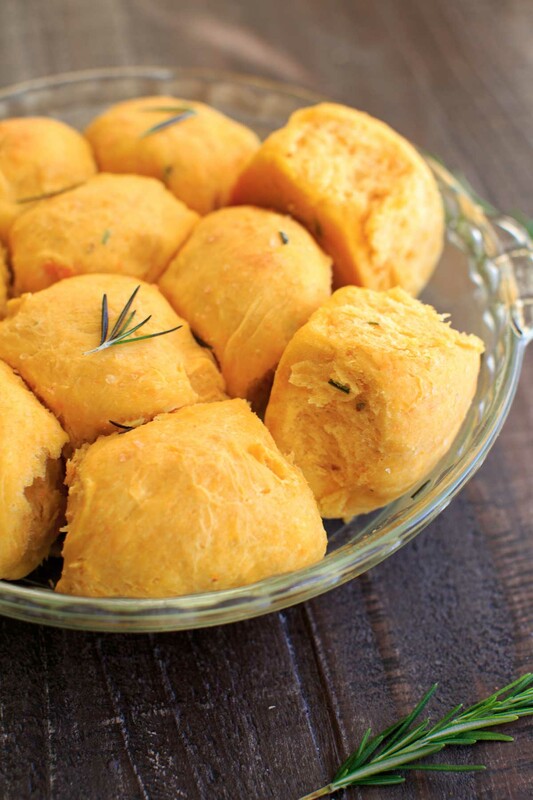 Perfect for holidays, dinner parties, and using up leftover mashed sweet potatoes. 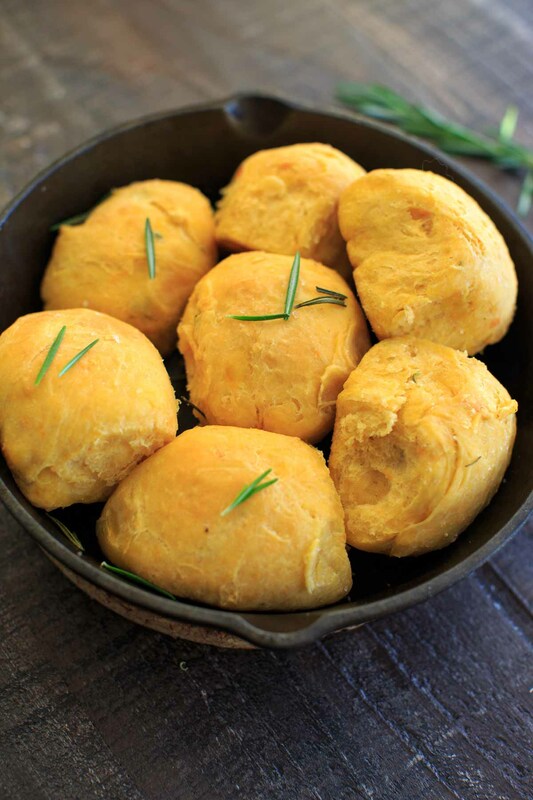 Click here to save this sweet potato rolls recipe on Pinterest! THESE ROLLS ARE THE BEST ROLLS I’VE EVER EATEN. The. Best. I’ve. Ever. Had. And I’ve had a lot of rolls. That includes steak house yeast rolls (what else does a vegetarian eat at a steak house? ), Sister Schubert rolls (which are my go-to when I’m too lazy to bake), and literally any other kind of roll. First up – the sweet poatoes. Mixing up the sweet potato mixture made me realize, you could totally use LEFTOVER mashed sweet potatoes for this if you choose. 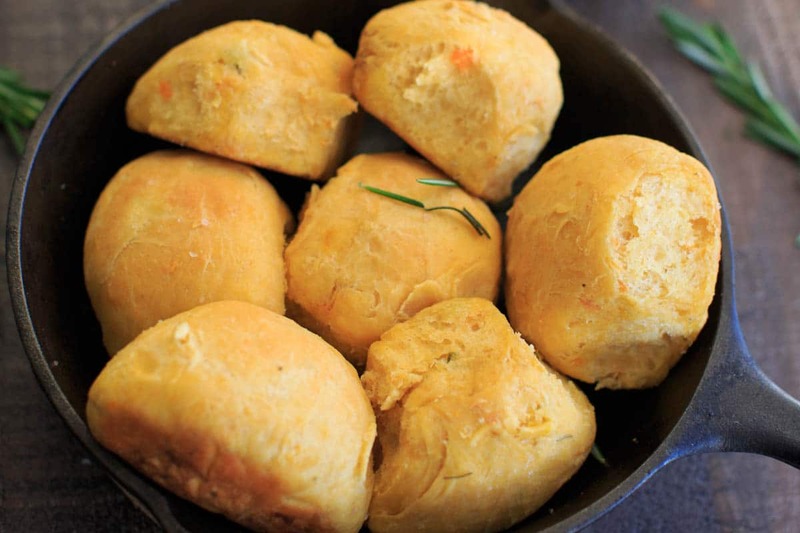 The flavor will be adjusted depending on what you’ve put in those potatoes – is it milk, butter, herbs? That’s basically what we’re doing here anyway. 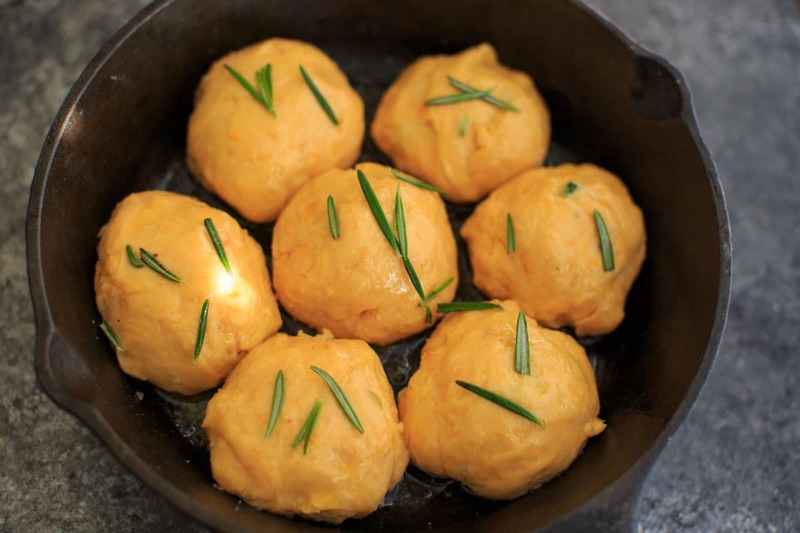 If you don’t have leftovers to use, it just takes 20 minutes or so to boil some sweet potatoes. I don’t know how this is the first time I’ve tried mashed potato in bread, but I’m telling you – IT’S a GAME CHANGER. I’ve always loved rosemary bread, but this is a whole ‘nother level. Melted butter + sea salt is KEY for the topping, as it just accentuates all the flavors. Extra rosemary on top, if you want. It probably won’t stick, but it’s good for show. Don’t worry, there’s rosemary in the dough too. Maybe a little dramatic. But so good. I don’t know what else to say about these rolls, except MAKE THEM. 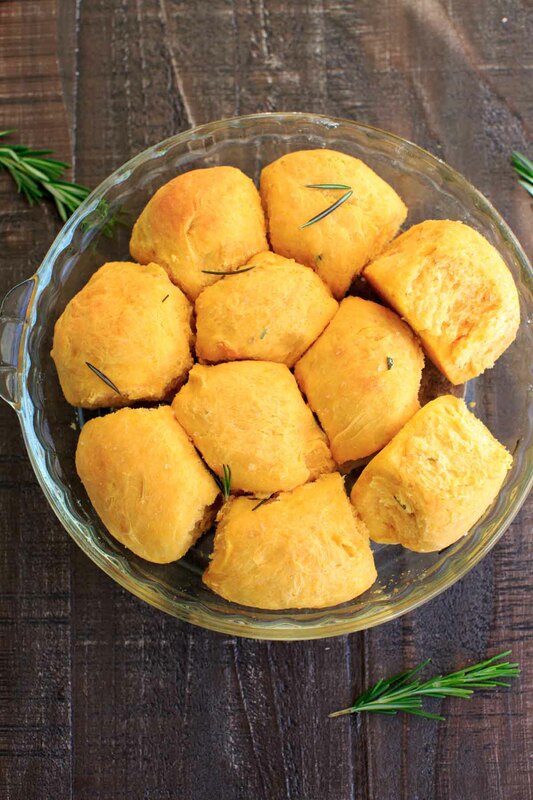 They are perfect for dinner parties, potlucks, Thanksgiving or Christmas. Or … just a Saturday night? I wouldn’t recommend making them TOO far ahead of when you’ll need them. Only because you’ll probably want to eat them all. In a large (stand-mixer) bowl, add hot water, yeast and sugar and stir to combine. Set aside until bubbly, about 5 minutes. 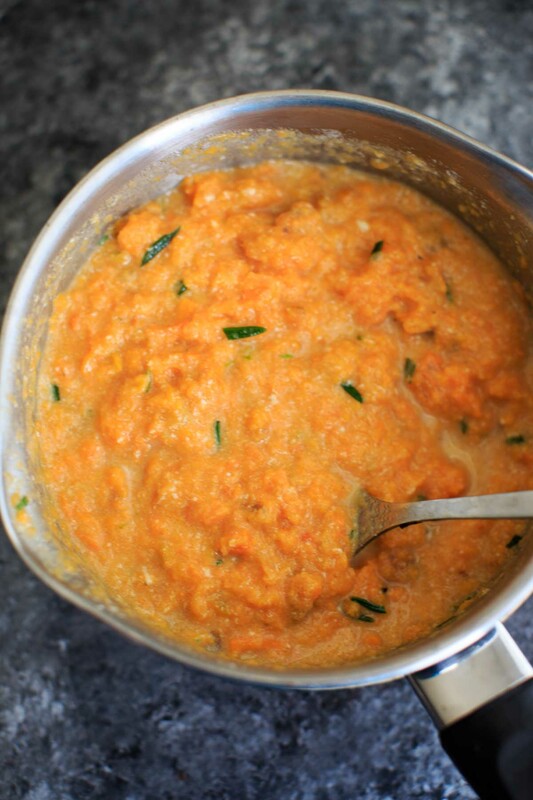 Add in mashed sweet potato to milk mixture and stir. Add to yeast mixture. 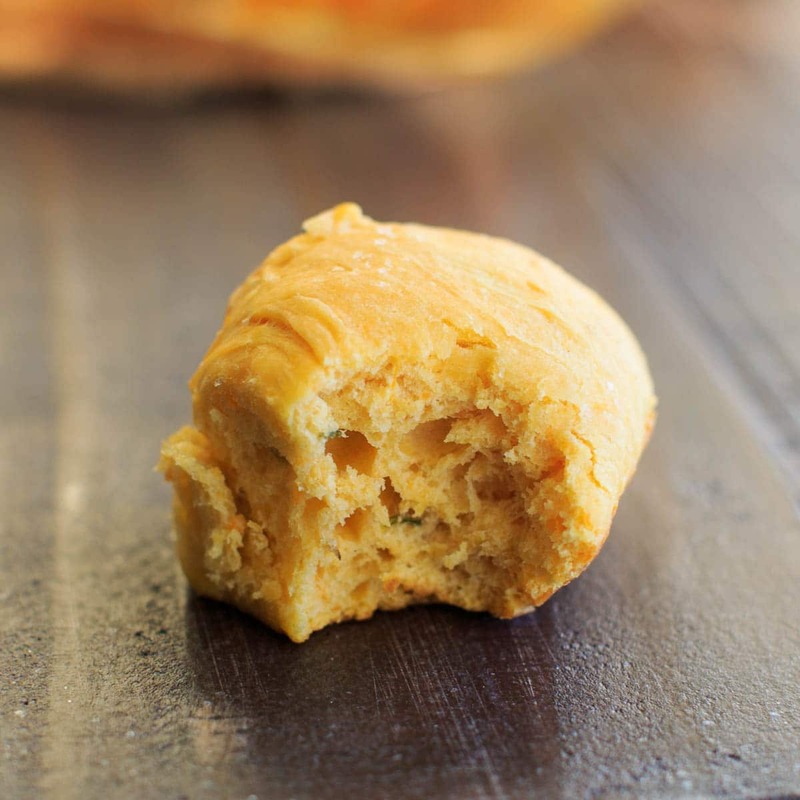 Using the stand mixer, add in eggs to combine. Then slowly add in flour until combined. Add in more flour if necessary until dough is smooth. Dough should be slightly sticky but not stick to sides of bowl or hands. Cover and place in warm spot to rise for 1 hour or until doubled. 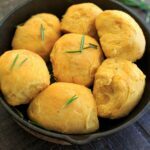 Make rolls out of the dough to form 18 small balls. Place on greased baking sheet or cast iron pan. Bake at 350°F for 25-30 minutes or until lightly browned. 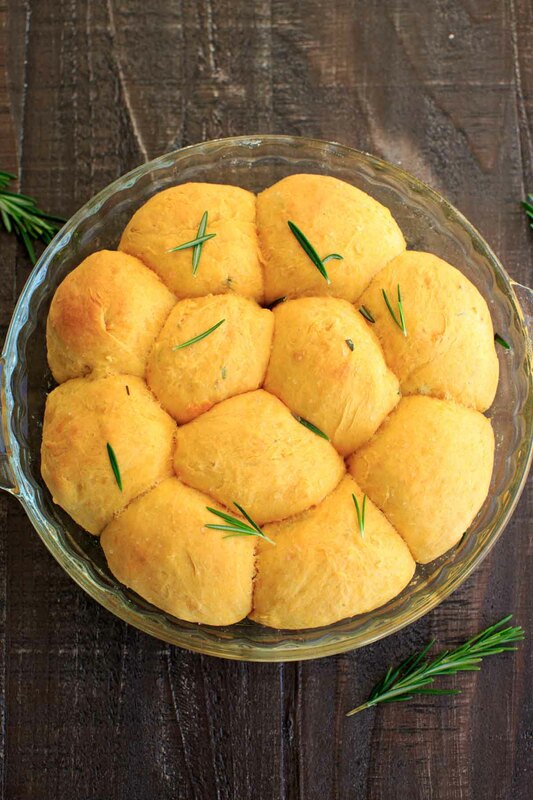 Brush with melted butter and top with sea salt and extra rosemary. Best served warm.